Introducing the Freedom Retreat for Magical Mamas! This fall I will be offering massage, yoga and dance in Metchosin, my beloved home community on the westshore of Vancouver Island. You can find me at Atman Clinic, or at the Lodge at Weir’s Beach where I will be working a new schedule as my daughter begins to attend preschool. This summer has filled me with vibrant sunlight and joy. I look forward to connecting with you to support your health, and to assist you to connect to your inner vibrance and the joys in your life. My new offering for this year is a somatic release technique called Focusing. Sessions can be woven into a bodywork session, or experienced on its own for a potent transformation of the emotional, mental and physical energies that can create blocks in our healing process. Look for Children’s Yoga and a Hatha Flow class to begin in October. Times and location will be announced. Wishing you a beautiful fall as we move into the season of nourishing soups, warm woollens, fires and the cleansing rains. Om shanti. 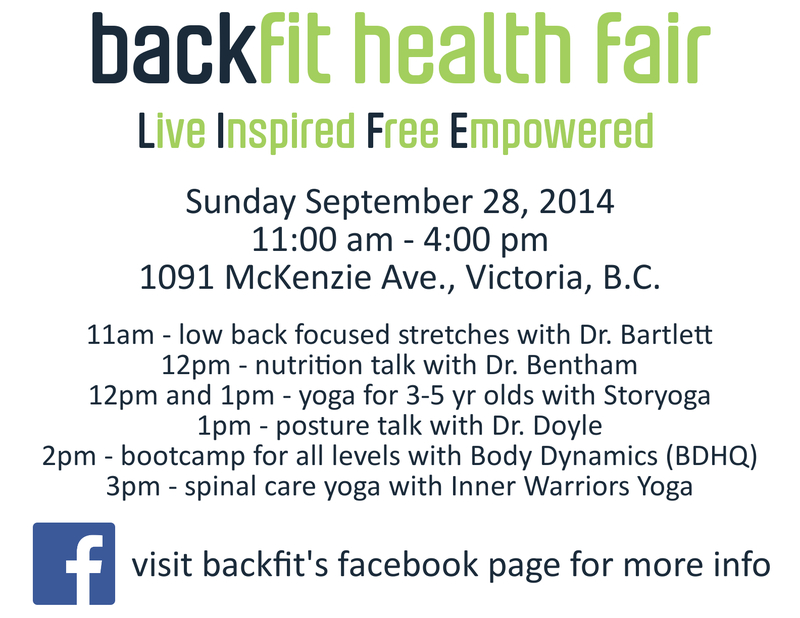 Inner Warriors Yoga will be participating in the Backfit Health Fair and offering free demos of our services including Spinal Care Yoga, Thai Massage Therapy and Cranial Sacral Therapy. I am offering Free Mini Thai Massage or Mini Cranial Sacral Sessions between 11am – 4pm. Bring the family for food, fun and top wellness tips! Hello everyone! This fall I am excited to be offering Cranial Sacral Therapy and Thai Massage at Inner Warrior Yoga, 1314A Esquimalt Rd. I am also offering Children’s Yoga and JourneyDance at Metchosin Yoga. Tuesdays and Thursdays 8am-3pm, Saturdays 11-2pm **if an evening session is more convenient for you, please let me know! Wishing you joy and health for the upcoming fall season! Thai Massage Therapy sessions are available during the day at the Den. If you are unavailable at this time, we can arrange for another location or time during the week. I can also travel to the comfort of your home! What is a Thai Massage you ask? An energetic massage traveling along 10 meridian pathways throughout the entire body and organ systems. From head to toe, techniques involve acupressure, joint mobility and assisted yoga poses. I use my fingers, hands, elbows, knees and feet to create varying levels of acupressure to your liking. Being fully clothed, the massage is performed on a mat on the floor, with bolsters and pillows for support in a variety of positions. It is unique in that it works on multiple levels simultaneously – physical, emotional, mental and spiritual aspects in a deep and therapeutic manner. It can be calming, soothing and gentle or vigorous and stimulating. I have specializations in pre and post natal massage, hands free backwalking, and cupping and scraping techniques, available upon request. Check it out and treat yourself to a holistic and energizing massage! Register to start next week, or drop in any time! Prenatal yoga is a wonderful way to connect to the beauty of your changing body, your baby and to meet a community of other pregnant women. This class is taught with an emphasis on increasing body and breath awareness, learning pain management, prenatal bonding and relaxation to promote the well-being of you and your baby. Gentle, safe movements and stretches are designed to strengthen, open the body and ease the common discomforts of pregnancy. Breathing exercises, pelvic floor awareness, visualizations and relaxation techniques help to prepare your body and mind for childbirth with confidence and calmness. No previous yoga experience is necessary. Come to yoga and spend time with baby in a fun, relaxed and supportive environment! A gentle class that’s builds at your own pace. Release tension, restore strength and support your body’s natural recovery process from pregnancy and childbirth. Embrace your beautiful new mama bodies! Be in the company of other women as we share with each other and our babies. Recommended for babies who are 4 weeks til crawling. No yoga experience in necessary. Please wait 4 weeks after birthing vaginally to begin your practice, and 6 weeks for Cesarean births. It is always best to consult your medical care professional to see if yoga is right for you at this time.